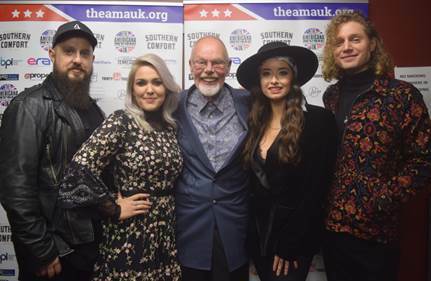 Friday 02 February: Last night, folk-Americana band The Wandering Hearts picked up the coveted ‘Bob Harris Emerging Artist’ award at the UK Americana Awards 2018 – a prize hand-picked by the music legend himself. The awards ceremony took place at Hackney Empire in London where they collected their prize in front of a sold-out audience, including Chris Difford, BBC DJ Simon Mayo, footballer Steve Bull and Sir Patrick Stewart. 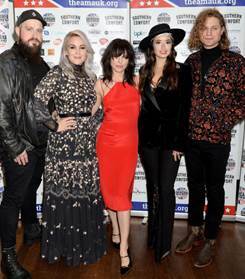 The band also performed their current single ‘Burning Bridges’ taken from their upcoming debut album Wild Silence, as well as joining together with Imelda May, Mumford and Sons and Robert Plant for a rendition of the late Tom Petty’s ‘Wildflowers’. The Wandering Hearts’ debut album Wild Silence is out on Decca Records on Friday 9 February. They are also set to embark on their first sold out UK Tour, including a show at London’s Bush Hall on 1 March.